Tattoo Blog » Meet Electric Pick! 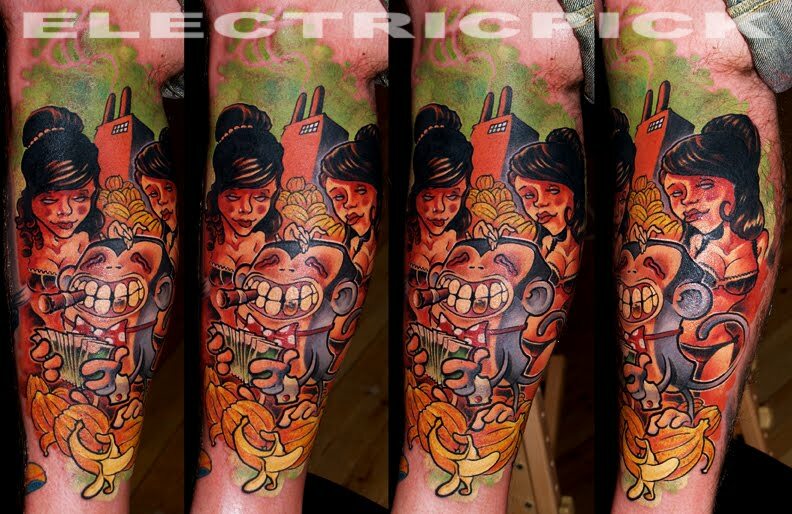 Tattoo Blog » Uncategorized » Meet Electric Pick! Nothing lasts forever. We all know that. Often what makes works of art even more beautiful is knowing that they won’t last or that one day they’ll be gone. The sand mandalas that Tibetan monks create is a perfect example. Gorgeous hand crafted art that’s here today and gone tomorrow, forcing us to recognise the impermanence of beauty and its place in our lives. While not exactly a Buddhist monk, the tattoo work of the artist known as Electric Pick won’t always be available to the public, either. Though he’s been tattooing ever since a Montreal tattoo shop owner bought 50 pages of his flash and subsequently offered him a job back in 1998, there will eventually come a day when Electric Pick packs it all in and focuses his skills instead on illustration. It won’t be an immediate stop of course – Pick plans on casually slowing down before eventually putting a stop to his commercial tattoo work. Regardless, simply knowing that a tattoo by an artist as talented as Electric Pick will one day become quite the rare commodity is enough to encourage anyone who’s hungry for a highly original and creative tattoo to seek him out. Though he travels extensively and loves the influence that travel has on him and his work, Pick currently spends the majority of his time in Denmark, helping out at Conspiracy Inc. His childhood was spent between Montreal, Canada and Paris, France, and that cross continental education no doubt helped him to see the world in a different light, a light that eventually began to illuminate the entire globe for him. Aside from Denmark, he’s spent time working in Hong Kong and New York City, to name but a few of the additional locales which fill his roster. And while tattooing may pay the bills and ignite his creative energies in a manner that benefits the entire tattoo industry, Pick’s number one love remains illustration and especially comic books. From the age of 12 when he says that the realisation struck that he would always draw for a living, the art, colour and lure of comics has never ceased in its intensity for Pick. I for one really like the way that Pick goes with what he loves best and what he feels matters. Despite the dedication and effort that tattooing requires, there’s an unpredictable rowdiness to his attitude about life which transfers itself directly into his art, making it some of the most interesting and pleasing work out there. Electric Pick might not always be around to tattoo, but for now he is, and that’s really all that matters.